Infiniti Computer Repair can install cctv systems for security at your home or business. We can configure it for online viewing on your laptop, smart phone or tablet. We specialise in ip network camera systems which can offer features such as motion detection etc. and upgradability. We can configure the system for 24/7 recording or just for live viewing over the internet, motion detection or a combination of all three. We only work with high end products that offer the best quality and reliability. We can supply and fit network cameras. We can also supply dedicated DVR/NVR units or laptops with CMS software. 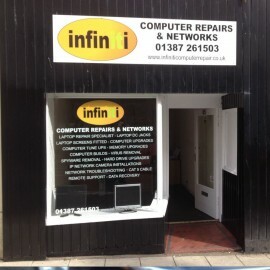 Infiniti Computer Repair have installed many CCTV systems in bars, restaurants and nightclubs in the Dumfries area. CCTV Dumfries systems installed in your home or office can give you peace of mind and help maintain security and aid in convictions. Why not drop by and have a look at some footage from our shop cameras and discuss options available to you. Give us a call if you are considering CCTV and book an assessment.